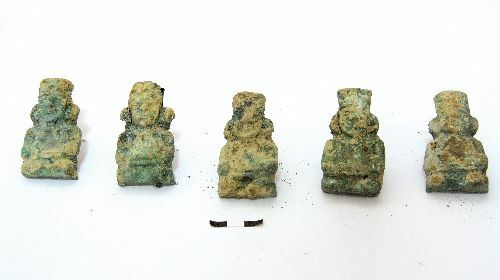 The archaeological research team working at Marcahuamachuco, Peru, has announced what it calls the “first important finding” in determining the site’s historical process: a collection of 10 metal figurines and many other ornamental objects, believed to be part of an offering made during the construction of the site. Objetos encontrados en Marcahuamachuco. Foto: ANDINA/Unidad Ejecutora Nº006. 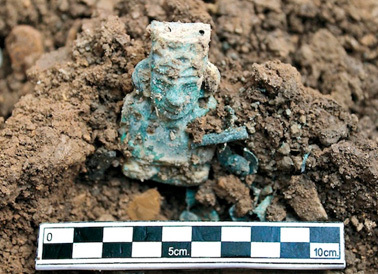 Jesus Holguin, director of the archaeological team, said that the figurines represent males dressed in hats, earmuffs and clothing. The figurines, some are which are sitting cross-legged, would have been manufactured by applying a thin sheet of metal to a solid cast of stone or wood, then tapping and shaping as required. 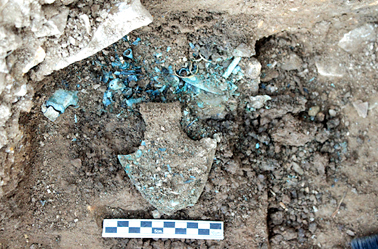 Among the ornamental objects discovered are earrings, necklaces, tupus(needles), and beads that could have been attached to canvases or banners. 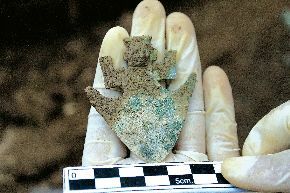 Guillermo Lumbreras, an archaeologist at Marcahuamachuco, said that the style of the pieces denotes traits derived from the Moche, one of the classical societies of northern Peru, in what is now the department of La Libertad. Lumbreras said he can see some Recuay influence in the design of the objects, but that the dominant features correspond to the Wari society. The pieces should assist scholars of the Middle Horizon period (500-900 AD) in understanding Huamachuco’s place in the historical process, especially the establishment of the Wari. The discovery also adds to previous findings at Marcahuamachuco, which include Spondylus objects from the equatorial coast and volcanic rocks from the south-central highlands. These findings have led scholars to believe that the Huamachuco people established exchange networks over long distances. GHF’s partner in the project is the Unidad Ejecutivo Marcahuamachuco (UEM), which was established for regional development of the site and its satellites. GHF and the UEM will work to prepare a program of planning, conservation and community development to enable long-term site sustainability. With excellent potential to become one of the first UNESCO World Heritage Sites in the northern highlands of Peru, Marcahuamachuco will provide a major focus for economic development in an area with few opportunities for local communities.